Located on the edge of the Equator, Uganda is positioned in south-central Africa, and bordered by the Democratic Republic of the Congo (DRC), Kenya, Rwanda, Sudan and Tanzania. 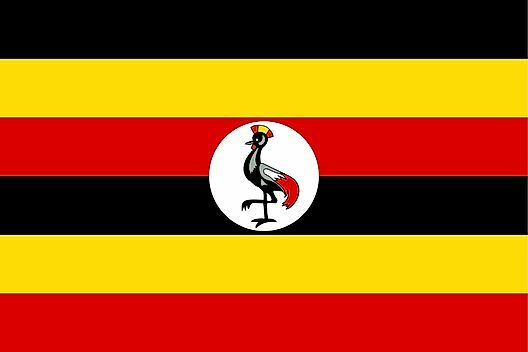 Uganda averages about 1,100 metres (3,609 ft) above sea level, and while much of its border is lakeshore, Uganda is landlocked with no access to the sea. The Ruwenzori Mountains form much of the southwestern border between Uganda and the DRC. The highest peaks there are snow capped. In eastern Uganda, the border with Kenya is marked by volcanic hills. Uganda is replete with water and contains many large lakes. In fact, almost one-fifth of its total area is open water or swampland. Four of East Africa's Great Lakes - Lake Victoria, Lake Kyoga, Lake Albert, and Lake Edward lie within Uganda or on its borders. Lake Victoria is the second largest inland freshwater lake in the world (after Lake Superior), and it feeds the upper waters of the Nile River, which is referred to in this region as the Victoria Nile. Lake Kyoga and the surrounding basin dominate central Uganda. Additional lakes of note include Lake Kwania, Lake Bugondo, Lake George and Lake Opeta. The Nile River leaves Lake Victoria near Jinja, as the Victoria Nile. It flows for approximately 300 miles (500 km) further, through Lake Kyoga, until it reaches Lake Albert. After leaving Lake Albert, the river is known as the Albert Nile. It then flows into Sudan, where it is known as the Bahr al Jabal, or Mountain Nile.